Definitions of religion tend to suffer from one of two problems: they are either too narrow and exclude many belief systems which most agree are religions, or they are too vague and ambiguous, suggesting that just about anything and everything is a religion. A better way to explain the nature of religion is to identify basic characteristics common to religions. These characteristics may be shared with other belief systems, but taken together they make religion distinct. Belief in the supernatural, especially gods, is one of the most obvious characteristics of religion. It's so common, in fact, that some people mistake mere theism for religion itself; yet that is incorrect. Theism can occur outside of religion and some religions are atheistic. Despite this, supernatural beliefs are a common and fundamental aspect to most religions, while the existence of supernatural beings is almost never stipulated in non-religious belief systems. Distinguishing between the sacred and the profane is common and important enough in religions that some scholars of religion, notably Mircea Eliade, have argued that this distinction should be considered the defining characteristic of religion. The creation of such a distinction can help direct believers to focus on transcendental values and supernatural, but hidden, aspects of the world around us. Sacred times, places, and object remind us that there is more to life than what we see. Of course, merely noting the existence of the sacred usually isn't sufficient. If a religion emphasizes the sacred, then it will also emphasize ritual acts involving the sacred. Special actions must occur at sacred times, in sacred places, and/or with sacred objects. These rituals serve to unite members of the current religious community not just with each other, but also with their ancestors and their descendants. Rituals can be important components of any social group, religious or not. Few religions don't include some sort of basic moral code in their teachings. Because religions are typically social and communal in nature, it's only to be expected that they also have directions about how people should behave and treat each other, not to mention outsiders. Justification for this particular moral code rather than any other usually comes in the form of the code's supernatural origins, for example from gods which created both the code and humanity. Awe, a sense of mystery, a sense of guilt, and adoration are "religious feelings" which tend to be aroused in religious believers when they come in the presence of sacred objects, in sacred places, and during the practice of sacred rituals. Usually, these feelings are connected with the supernatural, for example, it may be thought that the feelings are evidence of the immediate presence of divine beings. Like rituals, this attribute often occurs outside religion. Because the supernatural is so often personalized in religions, it only makes sense that believers would seek interaction and communication. Many rituals, like sacrifices, are one type of attempted interaction. Prayer is a very common form of attempted communication which might occur quietly with a single person, loudly and publicly, or in the context of a group of believers. There is no single type of prayer or single type of effort to communicate, just a common desire to reach out. It's normal for religions to present believers with a general picture of the world as a whole and the place of the individual therein - for example, whether the world exists for them of if they are a bit player in someone else's drama. This picture will usually include some details of an overall purpose or point of the world and an indication of how the individual fits into that as well - for example, are they supposed to serve the gods, or do the gods exist to help them along? Religions are so commonly organized socially that religious beliefs without a social structure have acquired their own label, "spirituality." Religious believers often join together with like-minded adherents to worship or even live together. Religious beliefs are typically transmitted not just by family, but by an entire community of believers. Religious believers sometimes associate with each other to the exclusion of non-adherents, and may place this community at the center of their lives. It might be argued that religion is such a complex and diverse cultural phenomenon that reducing to any single definition will either fail to capture what it really is or merely misrepresent it. Indeed, it's been argued by some that there is no such thing as "religion" per se, just "culture" and the various cultural manifestations which Western scholars tend to label "religion" for no objectively definable reasons. There is some merit to such an argument, but I think that the above format for defining religion manages to address the most serious concerns. This definition recognizes the complexity of religion by emphasizing the importance of multiple basic characteristics rather than simplifying religion to just one or two. This definition also recognizes the diversity of religion by not insisting that all characteristics be met in order to qualify as a "religion." The more characteristics that a belief system has, the more religion-like it is. 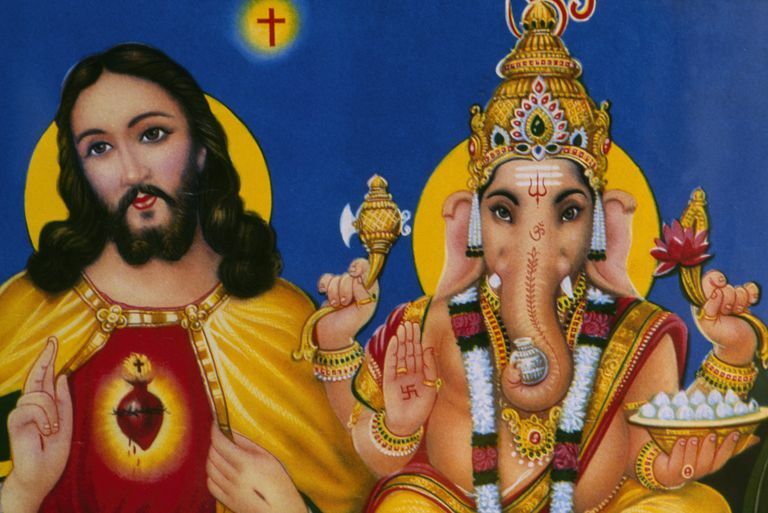 Most commonly recognized religions — like Christianity or Hinduism — will have all of them. A few religions and a few manifestations of common religions will have 5 or 6 of them. Belief systems and other pursuits that are described as "religious" in a metaphorical way, like for example some people's approach to sports, will exhibit 2 or 3 of these. Thus the entire gamut of religion as an expression of culture can be covered by this approach.